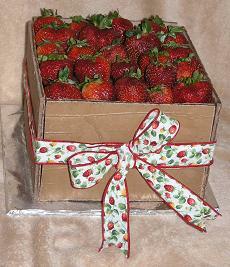 This unique strawberry cake recipe delicious will be a hit at any event. Located right outside of Raleigh in Fuquay Varina, NC, Piece-a-Cake makes and delivers cakes in several delightful shapes and sizes to Apex, Cary, Sanford, Holly Springs, Chapel Hill and all of Wake county. Try us at your next special event! 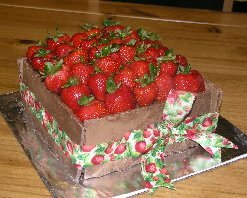 This “Piece-A-Cake” unique cake design will be taste perfection to the strawberry and chocolate lovers. We offer all of our recipes to our visitors to download for free. 4 14oz bags chocolate candy melt, I use Wilton. Microwave in 30 second intervals until melted. 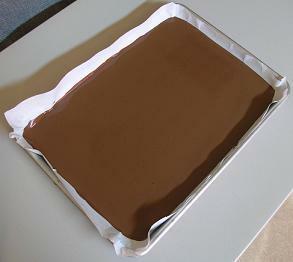 Place wax paper in 2 18-inch cookie sheets then pour into cookie sheets leave at room temp until hardened. Then you will have plenty to cut for your sides. Preheat oven to 350 F. Sift together flour, baking powder and salt. In another bowl combine sugar eggs, vanilla and butter and beat for 3 minutes. Combine your sift mix and creamed mix together while adding the crushed strawberries and beat for two minutes. Pour batter in two 8-inch square greased and floured cake pans. When oven is pre-heated, bake for 25 to 30 minutes until done. Set on wire cooling rack to cool. Mix and heat strawberry glaze slightly until thick and creamy. When cakes are cooled, stack and poke holes in the cakes about every inch or so. I use a ½ inch wooden dowel rod. Pour strawberry glaze over top, fill holes and spread on sides, to help the chocolate sides adhere. Cut chocolate sides to make box about 1 inch higher than the cake. 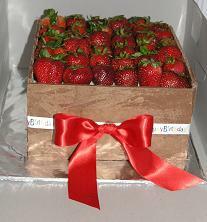 Tie up with your strawberry ribbon and place fresh strawberrys on top. Follow the instructions and this strawberry cake recipe is a Piece-A-Cake!